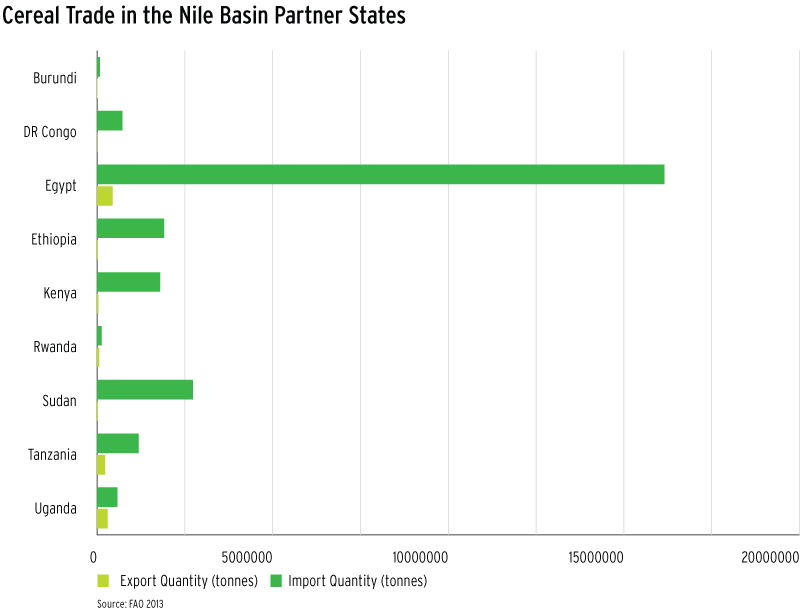 The Nile Basin region grows staple crops, such as oilseeds, groundnuts, beans, cassava, sesame, maize, and rice, in addition to fruits and vegetables such okra, tomatoes, onions, and cabbages. Much of the production is for home consumption, although there are both local markets and cross border trade takes place. Much of the trade is informal or un-recorded between the communities in the countries. Trade is mainly women traders selling agricultural products in markets; however, only few of these women market their own produce, much of the produce is bought across the borders from other countries. 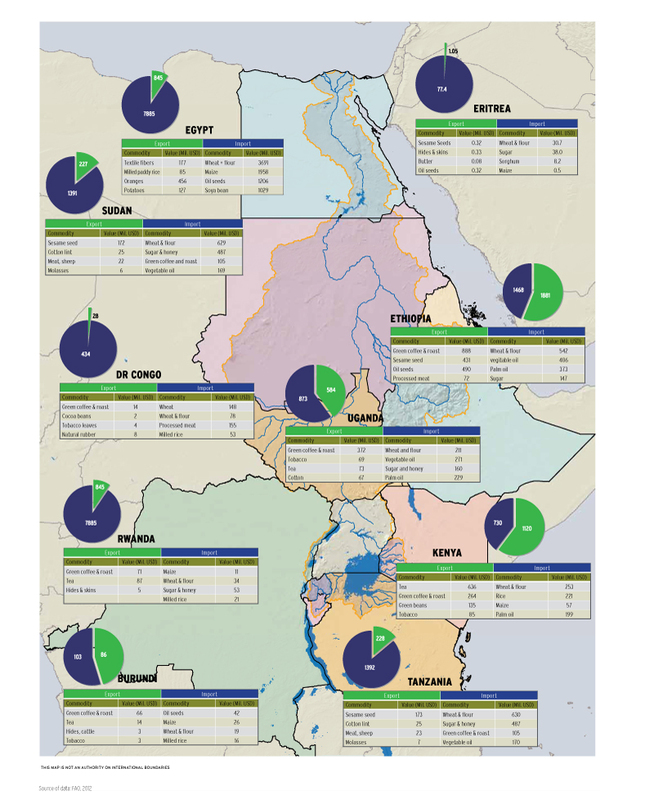 However, according to FAO/WFP Crop and Food Security Assessment Mission (2014), countries or parts of countries of the Nile Basin register food deficits. Much cross border trade both formal and informal is of cereals moving through grain corridors to fill-in deficits. The food and livestock markets in the countries are highly fragmented as a consequence of the poorly developed road network. Livestock such as cattle and small ruminants (sheep and goats) are thriving in the region and form part of the livelihood enhancement. Marketing of small ruminants in the countries and informally across the boarder represents one of the sources of income that largely determine pastoralists’ capacity to purchase food items. Another traded commodity is fish. In its fresh form, it is marketed on the local markets or large quantities that are processed, refrigerated and exported. In its smoked form fish is another commodity on both the local and the trans-boundary markets. The share of agricultural imports in total imports in the countries is higher than the share of agricultural exports in total exports. This shows an increasing reliance on food imports in the region to fill the deficit that is much influenced by the high population. Much of the imports are food commodities of cereals such as wheat due to the increasing consumer taste for the product and Maize. Food prices of food commodities in the Nile basin have remained persistently volatile and have affected countries, households and individuals. The region also faces increasing population, rapid urbanization, changing diets and demand for bio fuel products. These factors increase the demand for food commodities vis-à-vis a challenged food commodity supply due to high prices of fertilizers and fuel, climatic shocks, reduced food stocks, reduced exports and the imposition of food trade restrictions. The restrictions include export bans which increase the uncertainties of food movements between markets in the region, in some cases due to border conflicts. The food price situation therefore poses a significant challenge to the reduction of poverty and hunger. Generally most countries in the region export industrial crop commodities such as tea and coffee for export earnings and put their import expenditures to importing wheat or food crop commodities in global trade. Intra Nile Basin regional trade is mainly in cereals and pulses, livestock on hooves, and fruits and vegetables. Co-operation between the basin states could be very valuable in the development of the agricultural potential, leading to increased incomes and food security. Greater volumes of trade in agricultural production, combined with the increased use of optimal geographical growing zones for crops (while still securing local basic supplies) could improve efficiency and provide associated increases in economic returns.